I love a bit of nostalgia. Although, by definition, it's a bittersweet feeling, and I've never really thought of it that way. I find it's usually happy and comforting. Like the No-Bake Cookie. 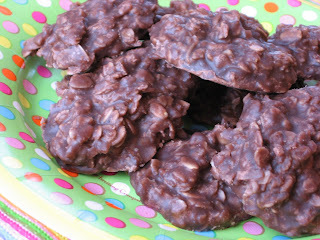 For me, No-Bake Cookies mean melt-in-your-mouth chocolatey sugar and grade school classroom parties. Someone always brought them, right? (Maybe the bitter part of this nostalgia is being homesick for the no-big-worry lifestyle of a 3rd grader?) I remember really liking these cookies, but only eating them at parties or other peoples' houses. Years later, I admit to having an appreciation for this cookie. It may be one of the fastest-making cookies ever, providing close to instant gratification. It has a fun sense of nostalgia. And it still has that distinct yumminess of chocolate-sugar. I do still wonder if it qualifies as a real cookie (are pastry chefs making these at home or sending them to school with their kids? ), but feel more confident making them with my ever-so-slightly more healthy and contemporary ingredients: rolled oats and dark chocolate. That kicks things up a notch, right? Anyway, I'm not ashamed to say I like them and I make them and, on top of that, I'm sharing the recipe. Enjoy! And party like a 3rd-grader. Get all ingredients and wax paper ready before beginning. Melt butter in large skillet. Take off heat and add sugar, cocoa, and milk. Return to medium heat, stirring constantly. When it reaches a full rolling boil, cook and stir for 1 and 1/2 minutes (do not overcook). Turn off heat. Add all at once-peanut butter, coconut, pecans, and oats. Mix thoroughly, making sure peanut butter is blended in. Spoon onto wax paper. Should firm up in 20-30 minutes. What a yummo recipe!!! I've never made no-bake biscuits before and am dying to give these ones a try... I just have one question... How much butter is in a stick of butter??? Is it 250grams?? I have never made no-bake cookies before. I think I suffer from the same food snobbery as you about cookies. But I will have to give these a try. And yes 1 stick of butter is about 250 grams or half a cup. Thanks for checking out our fun recipes, even if they aren't gourmet! Jodie, 1 stick of butter is 1/2 cup, or 8 Tbsp, or 113 grams.